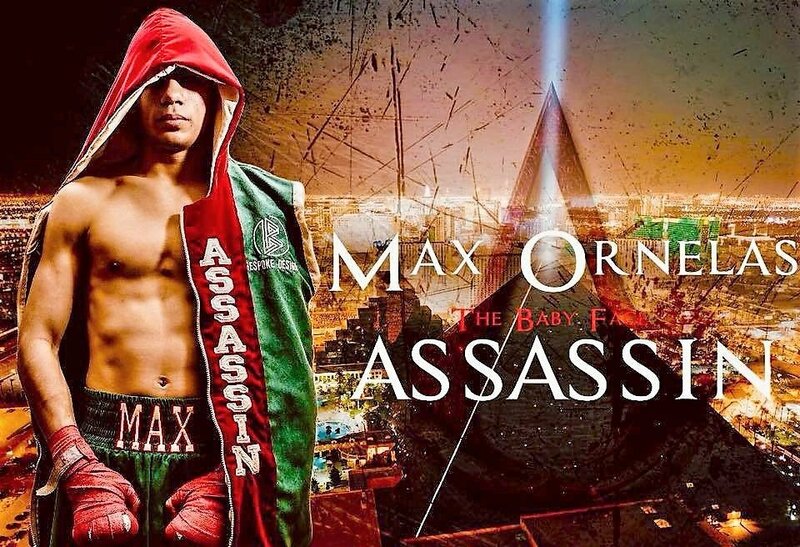 Max “Baby Face Assassin” Ornelas (10-0-1, 4 KOs) is an extremely busy, smart, hardworking, and talented individual who has significant goals laid out for himself both inside and outside of the boxing ring. Despite being an undefeated blue chip bantamweight prospect with a bright boxing future ahead of him, he is also a sophomore at the University of Nevada at Las Vegas (UNLV) with a major in criminal justice. Orneals’ ambition to graduate from a four-year college and become a world champion in the bantamweight division takes a lot of determination and great time management. He uses both of those skills to balance a fifty-hour week worth of classes and homework, and training, running, and sparring, which he does before and after school and on the weekends. Inside the ring, the nineteen-year-old orthodox fighter is off to a successful start in large part to his great footwork, amazing speed, and ability to read his opponents and anticipate what they are going to do next. Ornelas is currently ranked fourteenth by the WBA after just eleven fights and he has only lost two rounds. While studying for his upcoming final exams, he will take on the best opponent he has faced as a professional, Mexican-native Tony Lopez Jr. (12-3, 4 KOs) for his first regional title, the vacant WBA NABA United States bantamweight championship on April 20th. Both fighters are familiar with one another’s fighting styles since they share the same promoter (future hall of famer Roy Jones Jr. of RJJ Boxing Promotion) and they have fought on the same boxing card on two occasions (Nevada and Arizona). “This fight is going to start off as a chess match with both of us trying to figure the other out. However, after a couple of rounds, I want to take the fight over by pressing the action, effectively using my jab, throwing punches from all different angles, and then trying to knock him out,” said Ornelas. This eight-round main event will take place at the UNLV on-campus ring at the Cox Pavilion. Ornelas has fought five times in Las Vegas, his hometown, but this will be the first time that he has fought on his college campus. This bout will be televised live on beIN Sports, starting at 10 p.m. ET. Roy Jones Jr. Boxing Promotion signed Ornelas after his first professional bout (which came a day after he graduated high school) and they have steadily increased his level of competition each time out. So far, Ornelas has passed the test and beaten every opponent he has faced except for the previous unbeaten Leopoldo Martinez, who he fought to a second-round technical draw due to an accidental headbutt. Ornelas got revenge in the rematch, three months later via a fifth-round technical knockout. In his most recent bout in November, Ornelas recorded a unanimous decision victory over former WBA Pan-African champion, Nick Otieno in his first ten-round bout. Ornelas held an outstanding amateur record (38-5) against extremely good competition. It was highlighted in 2015 by a bronze medal at both the National PAL Champions and the United States Nationals. That year, he was ranked second in the United States in the 123-pound division. He is managed by world-class trainer Gil Martinez, who has been with him since he started boxing at the age of seven. For more information and the latest updates on Ornelas’ upcoming fights, friend him on Facebook at Max_Ornelas and add him on Twitter and Instagram @Ornelas_Max. “Once my boxing career is over, I hope to use my criminal justice degree to obtain a position as a F.B.I. agent or get some type of employment in the law enforcement field,” said Ornelas. Orneals’ second career will have to wait for a couple of years because right now, he is solely focused on becoming a world title holder in multiple divisions.